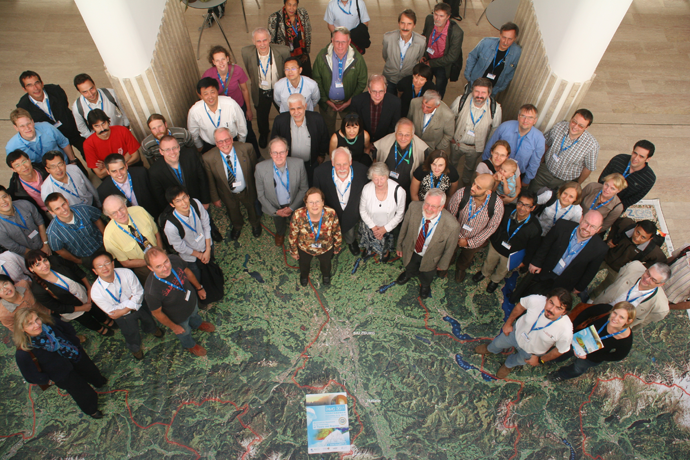 The conference welcomes contributions advancing the use of mathematics and informatics in the geosciences. Methodological and applied contributions are equally welcome. Focus methodological topics include: geostatistics (including MPS), statistics of compositional data, numerical simulation (flow, transport, deformation) perhaps under uncertainty, 3D modeling of natural objects, space-time information systems, spatial data models and structures, and remote sensing. For these main topics, methodological contributions without a direct illustration in a geoscientific problem are welcome, and of interest to many participants. The conference accepts oral and poster presentations, typically accompanied by an extended abstract in the conference proceedings. Acceptance of contributions for presentation at the conference is based on short abstracts (1500-2000 characters). Inclusion in the programme requires early registration of the presenting author. As a rule, one oral presentation and one poster presentation is admissible per presenting author. Exceptions might be considered, by invitation. Keynote lecturers are invited to submit another oral contribution with a substantially different topic. Extended abstracts (up to 10 pages and up to 2MB, only PDF with the conference templates accepted!) are required for inclusion of the contribution in the conference proceedings. These will go through an additional formal and scientific reviewing process, and will only be included in the proceedings if of good formal quality. Rejection of the extended abstract does not imply rejection of the contribution. Proceedings will be published exclusively in electronic version, with ISBN. Selected papers will be invited to special issues of the three journals owned or sponsored by the IAMG: Mathematical Geosciences, Natural Resources Research and Computers and Geosciences. Some focus sessions have their own plans for publications of special issues. Acceptance of a contribution for presentation at the conference is based on short abstracts. Abstracts will also be provided to all registered participants prior to the conference for the preparation of their individualized conference programme. Abstracts must be strictly between 1500 and 2000 characters and are in pure text format, copied to a dialog box in the conference management system. Only common latex/tex markup code is acceptable, but this will be counted as characters (AMS packages special characters accepted). If a devoted session already exists, submission to that particular session. These will be announced in due course. Session-free contributions are also possible, and encouraged. Names, e-mail addresses and institutions of all authors. A 1500 to 2000 character abstract. This can be copy-pasted from a plain text or simple tex/latex document of your own. Submission of an abstract constitutes a declaration of willingness to participate in the conference if the abstract is accepted. Abstracts are uploaded through the conference web-site Author Login. You must use your account to the IAMG-members web-site to log in. If you do not have such an account you should create one on the IAMG membership registration web-site http://www.iamgmembers.org/catalog/index.php?main_page=login. This account is used to manage your abstracts, to register for the conference, and for all steps of the reviewing process, as well as to become a member of IAMG, if you wish. The account creation does NOT automatically make you a member of the IAMG. Contributions not following the style of the conference will automatically be rejected by the conference system. If no PDF in the right format is submitted, the contribution will not appear in the proceedings. Posters must be in A0 portrait (1189mm heigh, 841mm wide). Larger posters or landscape versions are not acceptable. Poster presenters are expected to: print the poster at their convenience and bring it to the conference, to prepare a 1min teaser presentation to be given in the corresponding oral session, to be present at the poster during the poster presentation sessions and to provide some A4 or letter printouts of the poster to interested visitors. It is good practice that these A4/letter handouts are readable: if all the text can be read in that small format it will be also comfortably readable in large form on its panel. A poster must state at least: the title of the contribution, the authors, the e-mail of the corresponding author, the assigned presentation number (session and poster number) in the lower left corner corner, and that it is presented at the IAMG 2015 conference. No further format requirements are given. It is also recommended that it includes a photo of the author(s) present at the meeting, to make it easier for interested delegates to identify and approach the authors. There are strictly 14min plus 4min for discussion. Presenters will be automatically interrupted after 15min, to ensure discussion time and that other presenters have their fair share of time. Slides should be uploaded to the conference website on the Thursday before the conference and will be made available at each presentation room. Detailed hardware and software information on the computers available for presenting at the conference will be later provided here. Presentations are expected to be in standard format (PDF, PPT, PTTX or ODP), running on a Windows 7 machine with the latest office software (MS Office 2010, OpenOffice 4.1, Acrobat Reader X). Other formats (videos, SWF, 3D viewers, etc) might be possible on request: please contact us well in advance in this case. Presentations must be checked for technical problems prior to the presentation on the computer in the presentation rooms, during breaks. Each room is equipped with a computer, a projector and a laser pointer. Own computers are not acceptable for presentation.